There's a quote attributed to Benjamin Franklin that goes, "Either write something worth reading or do something worth writing." Right now I'm smack in the middle of the doing part. And as such, I'm very short on the writing part. So much to tell you if I could just get a free moment to get it all down. Soon my friends, very soon. I didn't bring our electric pencil sharpener as it would be useless with the 220 volt electricity here. And though I've looked for an electric pencil sharpener here in Macau, I've not found one yet. 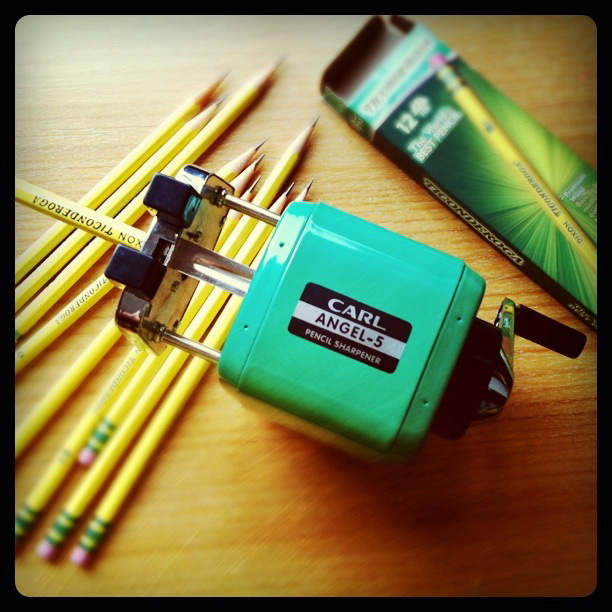 But these beautiful Carl Angel-5 pencil sharpeners are everywhere. I picked one up quite cheaply, maybe a couple U.S. bucks at the most. The design hasn't really changed at all since 1960. I was curious about where they are made and when researching, I found in the United States they run about $30 US Dollars, with some having a price tag in the $80 range! I love mine. There is something so relaxing about sharpening a box of pencils by hand... Something that must be done frequently with all the little writers and artists around here! Happy September! something about a pencil sharpener... maybe because i'm a teacher... but it sparks learning... being productive.